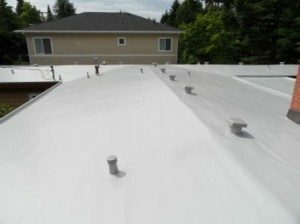 Polyvinyl Chloride (PVC) membrane roofing or PVC vinyl roofing is made of two ingredients: fossil fuel and salt. Petroleum or natural gas goes through a process to make ethylene, while salt is subjected to electrolysis to separate chlorine. Ethylene and chlorine then combined to produce ethylene dichloride (EDC), which is further processed to produce a gas called vinyl chloride monomer (VCM). The membranes of PVC vinyl roofing have longer life cycles, which is why it is a popular choice for commercial roofing for over forty years. PVC vinyl roofing is also known to provide energy-efficient roofing option due to its light coloring, which reflects the sun’s heat. Heat, then, only increases by 10 to 25 degrees Fahrenheit as compared to other roofing that reflect a lot less. Vinyl membranes can also be applied as waterproofing for green or planted roofs. It should be noted, however, that green building organizations do not recommend using PVC roofing due to environmental and health hazards that it poses during the manufacturing process.